If the Yankees don’t win the AL East — they are four games back in the loss column with 62 games to play, so the race is far from over — it’ll be because they didn’t beat the teams they’re supposed to beat. Wednesday afternoon’s 3-2 loss to the Rays dropped the Yankees to 11-11 against the Rays and Orioles this season. The Red Sox are 19-6 against them. There’s the difference in the division right there. The Yankees scored their two runs Wednesday with some good ol’ fashion run manufacturin’. Gleyber Torres, in his first at-bat back from the disabled list, worked a walk to start the second inning. Greg Bird followed with a bunt single against the shift — it was effective, but Bird looked very much like a player who hasn’t bunted a while lot in his life, so I award him no style points — then Miguel Andujar moved Torres to third with a fly ball to center and Neil Walker brought him home with a fly ball to left. A 1-0 lead after three half-innings. Fast forward to the eighth, when they were down 3-1, and the Yankees scored another run on a sacrifice fly. Exciting stuff. Brett Gardner drew a leadoff walk, Didi Gregorius pulled a ground ball single through the left side to move Gardner to third, and Giancarlo Stanton brought him in with a two-strike sacrifice fly against Sergio Romo. We were all waiting for the ugly strike three hack at the Romo slider. Instead, a sac fly. The Yankees have 36 of those now, the most in baseball. Hooray small ball. 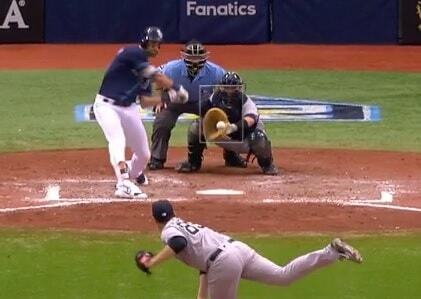 The Rays tried like crazy to let the Yankees back into the game in the ninth. First, they played Romo at third base (!) because they wanted to keep him in a game but have a lefty face Bird. Bird bunted against the shift but didn’t test Romo, and he grounded out into the shift. Andujar reached on an infield single and Aaron Hicks, who pinch-hit earlier in the game, hit what looked like a game-ending 4-6-3 double play ball off the bat, but the throw was a little wide of second base and everyone was safe. Two men on, one out. Yankees in business! … to strike out to end the game. Terrible swing to end a terrible game. All told, the Yankees had ten baserunners Wednesday. Two walks, five (!) infield singles, an error, a ground ball single to right, and a legit line drive single to left. 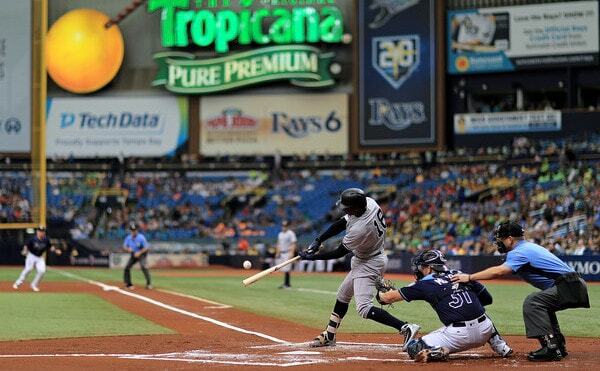 The Yankees have scored 20 runs in six games at Tropicana Field this season with only two homers. My quick math has them at .209/.283/.286 in 233 plate appearances at that ballpark this year. Gross. Gross as hell. Start hitting dingers again, guys. All things considered, a very good start for No. 7 starter Luis Cessa. He has a low bar to clear — just be better than Domingo German — and he did that by plenty Wednesday afternoon. Cessa limited the Rays to two runs and four baserunners in 5.1 innings. Timing is everything though, and those four baserunners turned into two runs thanks to an Adam Moore single and a Kevin Kiermaier two-run homer in the sixth inning. Cessa pitched around back-to-back one-out singles in the second inning and retired eleven straight batters before the Moore single to start the sixth. In hindsight, Cessa shouldn’t have been allowed to face the top the lineup (Kiermaier) a third time, especially with the bullpen rested, but man, he was cruising and his pitch count was in great shape. He threw only 74 pitches in those 5.1 innings. I understand leaving him in. Maybe don’t throw an 82.5 mph changeup here? Cessa’s slider is worth noting. He recently told Conor Foley that he hasn’t been throwing the pitch as hard lately, presumably to increase the separation with his fastball, and it seems to have worked. His average slider was 83.0 mph Wednesday. His career average slider velocity was 85.6 mph coming into this game. Hmmm. Maybe that does the trick? Either way, another good outing for Cessa, who was good last time out too. Yeah, it’s the O’s and Rays, but I’ll take it. Passes the better than German test. The Yankees used three relievers and the first, Jonathan Holder, allowed a home run to the second man he faced, so maybe pulling Cessa a batter or two earlier wouldn’t have mattered. Whatever. I’m not mad at the pitchers anyway. A.J. Cole struck out two in his inning and Dellin Betances struck out two while pitching around a two-out single. Three runs allowed should be a win more often than not. The Yankees are 6-7 in their last 13 games, and five of those seven losses have been by one run. (The others were by two runs and three runs.) In all five of those one-run losses, the Yankees had the tying or go-ahead run on base when the game ended. Pretty much exactly what happened in April. The Yankees lost a lot of close games and eventually things swung their way. But one homer in five games since the break? Seriously? 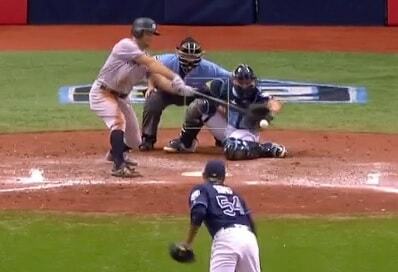 The Rays hit more homers in the sixth inning of this game than the Yankees have since the All-Star break. And before you come at me with “they can’t win without homers!,” the Yankees have the third best winning percentage in baseball in games without a homer. This is the worst. This quick three-game trip to Tampa is over and the Yankees are heading back to the Bronx for a six-game, seven-day homestand against the Royals and Orioles, the teams with the team worst records in baseball. Sonny Gray and Jacob Junis are the scheduled starters for Thursday night’s four-game series opener against Kansas City.